The Children’s Carousel features fairytale interactive figures and sounds, by Luna-Park, Poland. www.luna-park.eu. Photos by Lisa Stark, www.lisastark.com. 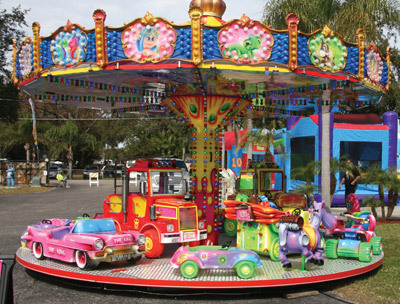 Described as the largest trade show in the carnival industry, the 47th annual International Independent Showmen’s Association, or IISA, “Super Trade Show Extravaganza” was held on the Showmen’s Club grounds last week, Feb. 3-7, in scenic Gibtown, Florida. True to tradition, the Trade Show was a bustling, colorful event with a large array of carnival and amusement products from around the world. 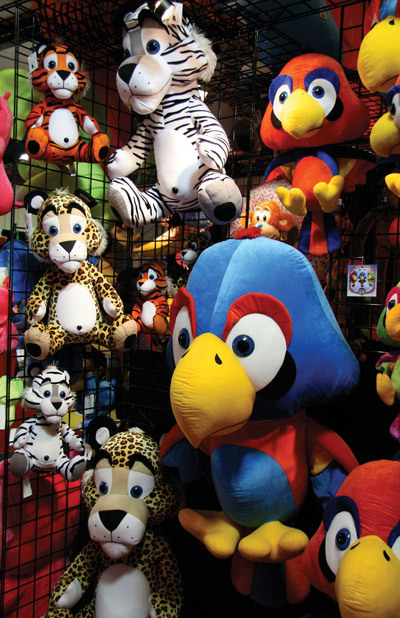 The 300-plus exhibits included rides, concession trailers, food supplies, inflatables, game merchandise, electrical supplies, novelty items, plush toys, jewelry, apparel, sound equipment, and more. Recreational vehicles and insurance, legal and financing companies were also represented at this year’s mega-event. 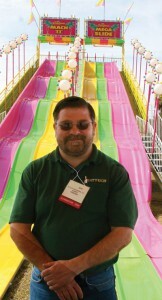 Albert Frieden of Battech Enterprises poses in front of the Mega-Slide ride. BattechRides.com. 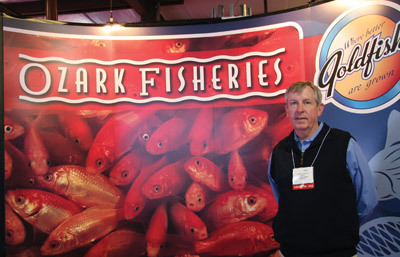 The trade show came in on the heels of what most consider to be an upbeat year for the fair and carnival industry. Some of the splashy outdoor attractions included the Centrifuge, Monster Truck, Surf Shack, California Mega-Slide, the Groovy-Bus, Jumpin’ Monkeys, SpinZone Bumper Cars, Zero Gravity and Cliff Hanger. Exhibitors came from as far away as Poland, Holland, the Netherlands, California and Oregon, while others were local vendors such as Galaxy Amusement Sales of Brandon and Backyard Canvas and Signs in Gibsonton. Major amusement ride exhibitors included Amusement Products, Chattanooga; Battech Enterprises, Salem, Ore.; Carousels USA, San Antonio; Dalton Kid-ride Rebuilders, Foley, Mo. ; Ital International, Nashville; KMG International, the Netherlands; Luna-Park, Szaflary, Poland; Mondial World of Rides, the Netherlands; Murphy Amusements, Cleveland, Texas; Owen Trailers, Riverside, Calif.; and more. In addition to the indoor and outdoor exhibitions, the show also featured daily seminars and workshops pertinent to the attendees, addressing the challenges affecting professionals in the carnival business. The International Independent Showmen’s Association is a nonprofit private organization. The original club building opened in 1966 and has expanded to be the largest Showmen’s Association in the United States, growing to more than 4,500 members worldwide. The IISA donates thousands of dollars each year to charitable organizations and issues scholarships to those in the outdoor amusement-business industry. 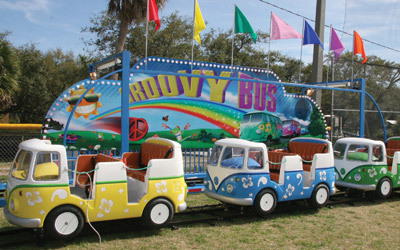 For more information on future events, visit www.gibtownshowmensclub.com or call 813-677-3590.